These things are known to increase bleeding times and thus bruising. Additionally, you can take Arnica and Bromelain the day of treatment. The former is a naturopathic anti-inflammatory medication and the latter is an enzyme (from Pineapple) that decreases the duration of a bruise should one occur. You can purchase both at Sprouts, Whole Foods and The Vitamin Shoppe. Bromelain 500mg - take two tablets immediately prior to injection and then one tablet three times a day for five days...or until bruise resolves. Ice can be applied for 48 hours post injection, then warm packs to the bruise thereafter. Should you get a troublesome bruise, we can also treat it with the IPL to break it down faster. How do I know which aesthetic treatment is right for me? We understand how intimidating it can be to the novice! With so many media images out there (the good, the bad, and the ugly! ), how does one find a good fit? The key is a thorough consultation to discuss your concerns and the outcome you’d like to obtain. Every single client is unique - we will educate you on the products that would benefit you, both those injected and those used in a home care routine. Every visit is a collaborative strategy to reach your aesthetic goals. I don’t want to look ‘overdone’. How much product will I need? That is what we aspire to, as well. Sadly, there are individuals who have a skewed idea of what “good” looks like and sometimes more is just, well…more! We pride ourselves on providing a natural enhancement so your friends will say “you look amazing! Have you been on vacation?” rather than “who did that and how much did it cost? !” Our injectors are known for their passion in assessing the face on a global scale to ensure that you fully understand the overall impact of any treatment. What is the difference between a wrinkle relaxer and a dermal filler? We hear this quite often from those just venturing in to aesthetic medicine. The truth is they are very different products with different methods of action – together they work synergistically to provide a more youthful appearance to those who receive them. Botox, Dysport and Xeomin address the muscle action that causes what we refer to as “dynamic” wrinkles. If you can no longer make the movement, the lines will fade away and provide the smooth, youthful look once enjoyed! As for fillers…well, they fill “static” wrinkles and folds and restore volume lost due to aging. There are a variety of products on the market, each having a specific strength and purpose. Some fillers, like Juvederm or Belotero, are used to fill lines/wrinkles and augment, or enlarge, an area (like lips). Others, such as Radiesse, not only fill but also stimulate your body to produce collagen, enhancing the results and providing a longer lasting outcome. We use a full array of products at Cielo, including Radiesse, Belotero, Juvederm (Voluma, Ultra, Ultra+, Volbella), Sculptra, and Restylane (L, Lyft, Silk, Refyne, Defyne). 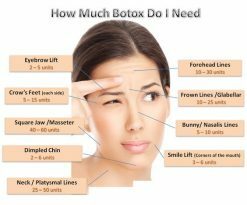 Where are dermal fillers and a wrinkle relaxers commonly used? Oh, the places we can go! Neuromodulators, like Botox, Dysport and Xeomin, are approved to treat lines between the eyebrows. They are also frequently used off-label to treat lines in the forehead, around the eyes, to lift the brows, prevent down turn of the mouth corners, the “orange peel” appearance of the chin, the bands that begin to show below our jaw as we age, and a square, tense jawline. Fillers can go nearly anywhere! While most are labeled to treat lines and folds of the face, some have been approved for augmenting the lips or hands. At Cielo, we use fillers to treat the entire face, the ear lobes and the hands! The duration of fillers is dependent upon a number of variables. The type of filler used, the mobility/animation of the area corrected, your personal metabolism and whether or not full correction is achieved during the first visit. Because all fillers will dissipate over time, it is best to plan on touch-ups/re-treatments to maintain the look. We'll advise you as to what you can reasonably expect from the filler chosen so you can plan your budget/schedule accordingly. Once the consultation has taken place and we've agreed on a treatment plan, the actual injections will take 30 minutes or less. The next question is always "will this hurt". Most all fillers now come with integral lidocaine...and we take other steps to alleviate discomfort, from ice to local anethesia. All in all, aesthetic injections are far less painful than most anticipate they will be. Lastly, the cost of fillers vary from type and how much is needed to achieve your desired aesthetic outcome. We offer OPTIMAL CORRECTION pricing that allows our customers to better afford the look they want. Additionally, we offer in-house monthly promos and the manufacturers offer promotions from time to time that allow us to pass the savings on to you.